Zimbabwe Broadcasting Corporation (ZBC) chief correspondent Rueben Barwe left for the United States to cover the 67th session of the United Nations General Assembly after the US Embassy in Harare ‘finally’ granted him a visa. 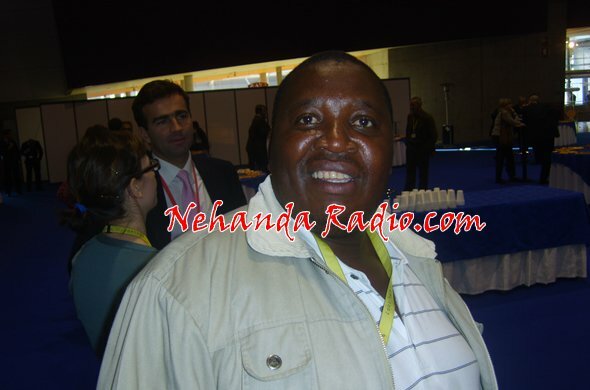 ZBC chief correspondent Rueben Barwe when he accompanied President Mugabe to the EU-Africa Summit in Portugal, December 2007 (Picture by Lance Guma). Barwe was not able to travel with Mugabe who left Harare Wednesday night for New York. Initial press reports claimed Barwe had been denied a US visa but the US Embassy in Harare issued a statement on Saturday denying this. “Visa processing can at times take longer than normal depending on the volume of applications; September is a high-volume visa processing time because of the UNGA. The United States takes seriously its role in facilitating foreign representative participation in the United Nations annual General Assembly. The embassy said delegations from nearly 200 countries travel to the U.S. each year for this meeting and the U.S. State Department makes every effort to process delegation visa applications, including Zimbabwean applications, in a timely and efficient manner. The U.S. government first applied targeted sanctions in 2003 and targeted fewer than 120 individuals accused of aiding and abetting the gross human rights abuses committed by the Zanu PF regime. This saw key members in the regime being slapped with travel and financial restrictions. Six Zimbabwean journalists, Rueben Barwe, Judith Makwanya, Pikirayi Deketeke, Caesar Zvayi, Munyaradzi Huni and Happison Muchechetere were placed on targeted sanctions by the European Union. The sanctions were only lifted this year in February after a review by the EU.